External hard disc drives have become the indispensable tool to double the storage capacity of any laptop and improve the storage capacity of any desktop computer. 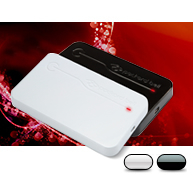 Therefore, if you are looking for elegant and easy to use storage devices, have a glance at the Packard Bell collection of external hard drives! All our new external hard drives include the Nero 10 Essentials suite, ready to be installed on your PC. Keep everything you hold dear in this 21st century treasure chest. It's your life in your pocket, and it's perfect for your life on the go.